Needless to say, that is completely unacceptable, and our top elected officials – and candidates for those jobs – need to call out Dominion Power for its deplorable behavior. Refusing any contributions from this rogue, climate-killing, corrupt company would be a good start. By the way, in addition to losing out to Maryland on the race for the U.S. offshore wind crown, Virginia is also losing out in terms of jobs. 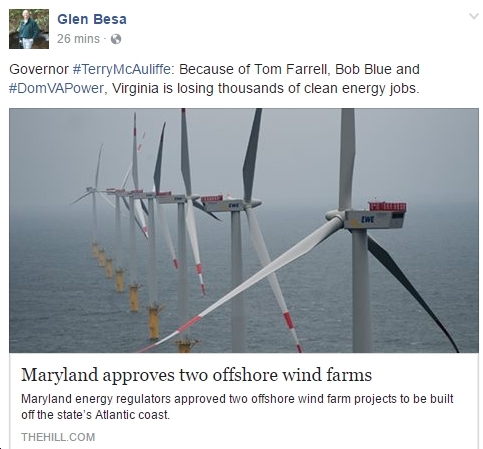 As former Virginia Sierra Club head Glen Besa puts it below, “Because of Tom Farrell, Bob Blue and #DomVAPower, Virginia is losing thousands of clean energy jobs.” And for what? So Dominion can keep throwing billions at more fossil fuel boondoggles like its idiotic, close-to-zero-jobs-created, soon-to-be-“stranded assets,” proposed fracked gas pipelines? Why do we allow Dominion Power to get away with this crap? Anyone? P.S. Also according to Glen Besa, a climate shareholder resolution (which stated that “Dominion does not have a GHG reduction goal, and does not provide information on its long-term strategy or plan to decarbonize in ways that are consistent with the Paris Climate Agreement” and that, “As investors, we are concerned that Dominion is not properly accounting for the risk of its current high investment in carbon-intensive generation“) received 48% of the vote — very close to a majority — at Dominion’s annual shareholder meetings this week in Richmond. In other words, the writing is on the wall for Dominion Power; they either change willingly or they will be forced by their shareholders, the citizens of Virginia, etc. to change. Next articleWill GOP Gubernatorial Candidates Show Up With Donald Trump At Liberty University Tomorrow?